Millwood Road north to Laird Drive, 1928. Source: City of Toronto Archives, Fonds 1231, Item 1571. As Richard Harris argues in Creeping Conformity: How Canada Became Suburban, 1900-1960, the fully planned corporate suburb is most often associated with the postwar boom in tract housing development. After nearly two decades with very little new housing owing to the Depression and the Second World War, North American cities experienced a massive growth in planned suburban communities to meet the demand from young and affluent families. This narrative is often applied to the history of suburban development in Toronto, with Don Mills featured as the first incarnation of this model. Image 1: Map of Toronto showing Don Mills and Leaside communities. Source: Google Maps, 2014. The area that became Leaside was first settled by Eurocanadians during the early nineteenth century. In January 1820, John and Mary Lea purchased a partially-cleared 200-acre farm on Lot 13, Concession 3 in the Township of York. His sons, John Jr. and William inherited the land when John Sr. died in 1854, and the family ran a successful farm on the flat, fertile and well-drained lands overlooking the Don River. The name ‘Leaside’ was first used to refer to William Lea’s home, but eventually came to refer to the entire area (See Image 2). Image 2: Tremaine’s Map of the County of York, Canada West (1860), with the area that became Leaside indicated. Source: George Tremaine, Tremaine’s Map of the County of York, Canada West, (Toronto: Geo. R. Tremaine, 1860). At some point during the 1870s, the Ontario and Quebec Railway (OQR) purchased the southeast corner of Lea’s property to extend its rail line from Toronto to Peterborough. In 1884, the Canadian Pacific Railway (CPR) leased the line from the OQR and built an operations subdivision for maintenance shops and rail sidings on the flat lands recently purchased from Lea. In 1894, the CPR opened a station at this location called Leaside Junction. Recognizing the northward urbanization of Toronto and the potential value of the land surrounding Leaside Junction, the CNoR began buying farms north and west of the CPR’s station and rail yards during the first decade of the twentieth century. 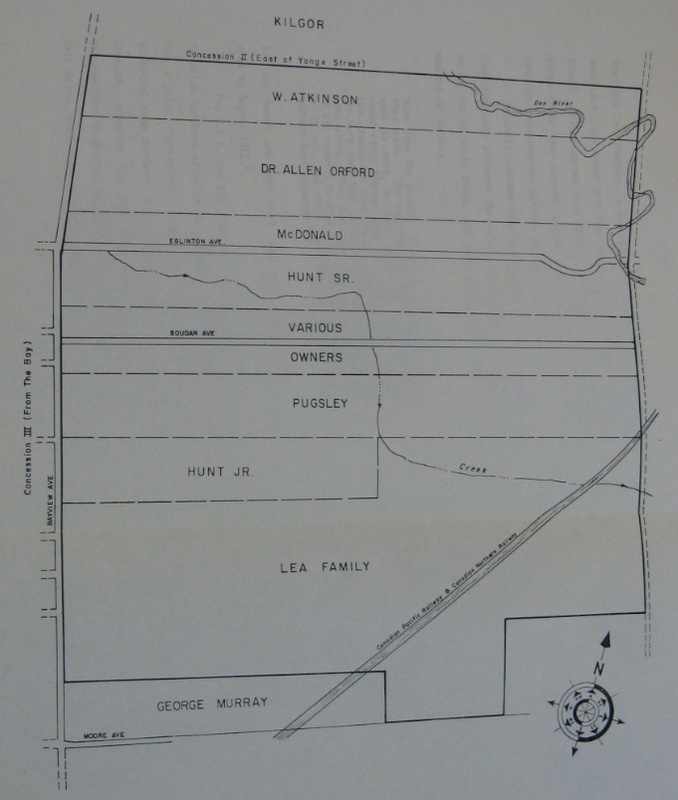 Referred to a “The biggest real estate operation ever carried out in Toronto” by the Toronto World in March 1912, the York Land Company (the CNoR’s development branch) bought 1,000 acres from nine landowners, including John and William Lea’s children, for approximately two million dollars (See Image 3). The following month, the CNoR announced its plans to use the 1,000 acres to build a residential community for upper-class residents of the city, which would become Toronto’s “new Rosedale” (an affluent neighbourhood north of Bloor). Image 3: Leaside as it appeared in 1912. Source: Kathleen Rennick, “The Town of Leaside: Origins and Development, 1913-1939,” (Department of Geography Research Project, University of Toronto, 1986), 17. The plan for Leaside was designed by landscape architect Frederick Todd. After working on plans for Port Mann outside Vancouver and Mount Royal in Montreal for the CNoR, Todd applied Garden City principles to Leaside. The Leaside plans included gently curving streets and zoning to separate commercial, industrial and residential land uses. But because the CNoR viewed Leaside as a revenue-generating development scheme, the Leaside plans did not include spaces for schools, parks, stores, churches or a library, fire hall and town hall (the municipality was expected to buy land for these from the York Land Company) (See Image 4). Image 4: The Todd Leaside Plan, 1913. Source: Kathleen Rennick, “The Town of Leaside: Origins and Development, 1913-1939,” (Department of Geography Research Project, University of Toronto, 1986), 23. By March 1913, less than a year after Todd’s Leaside plan was announced, the York Land Company had sold about half the land for almost three million dollars (a three-fold increase) to investors and developers, including Winnipeg real estate investor J.F. Hansen, the Bayview Land Company, and developers Neelys Limited. Around the same time, the York Land Company had the Town of Leaside incorporated in April 1913, and the Leaside plan was officially adopted in May 1913. Unfortunately, a number of factors combined to prevent Leaside’s development. The first was the financial challenges of providing services to Leaside. After the Town of North Toronto refused to annex the community in 1912, Leaside was obliged to take on over $150,000 in debt to pay for services. The second challenge was the extremely isolated location of Leaside, which made it very difficult to commute into downtown Toronto. The closest streetcar line was one and half kilometres away at Yonge Street and automobiles did not become widely popular until the 1920s. The third problem was the outbreak of the First World War, which effectively put a halt to any suburban development. The fourth factor was the financial collapse of the CNoR and its absorption into the Canadian National Railway in 1923, and the liquidation of the York Land Company. 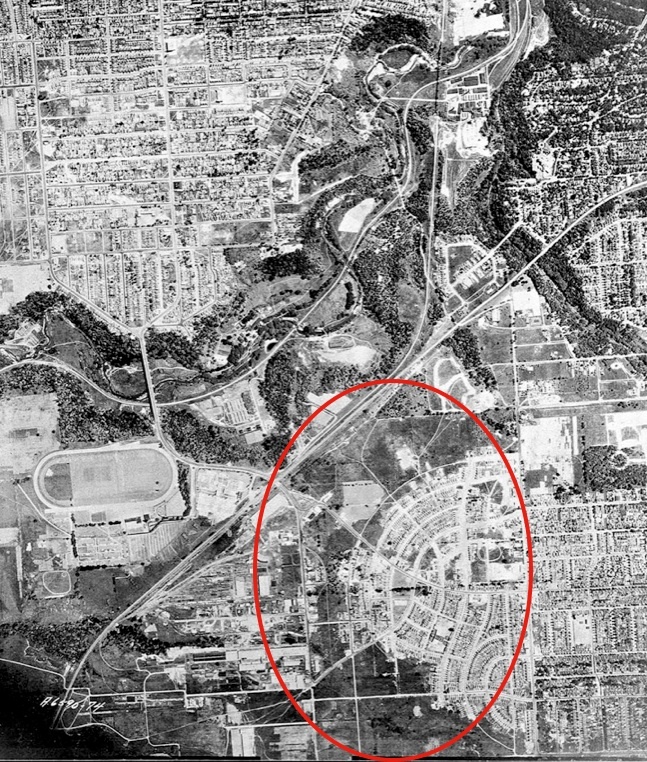 The final challenge to Leaside’s development was the onset of the Great Depression, which created even worse conditions for suburban development than had WWI. What kept the Town of Leaside alive between the First World War and the late 1930s was industry, not residential development. Todd’s Leaside plan also included land set aside for industrial development. In 1912, the Canada Wire and Cable Company was the first to take advantage of the proximity to the railway, the low cost of the land and taxes, and easy access to Toronto markets afforded by Leaside. During WWI, Canada Wire and Cable opened a subsidiary munitions factory, and in 1917 an airfield was built to train pilots for the Canadian Air Force. In 1931, Leaside’s industrial zone still boasted 29 companies, and by 1939 that number had increased to 52. The inclusion of these industries not only occasioned some residential development and provided jobs, but also subsidized residential property taxes. 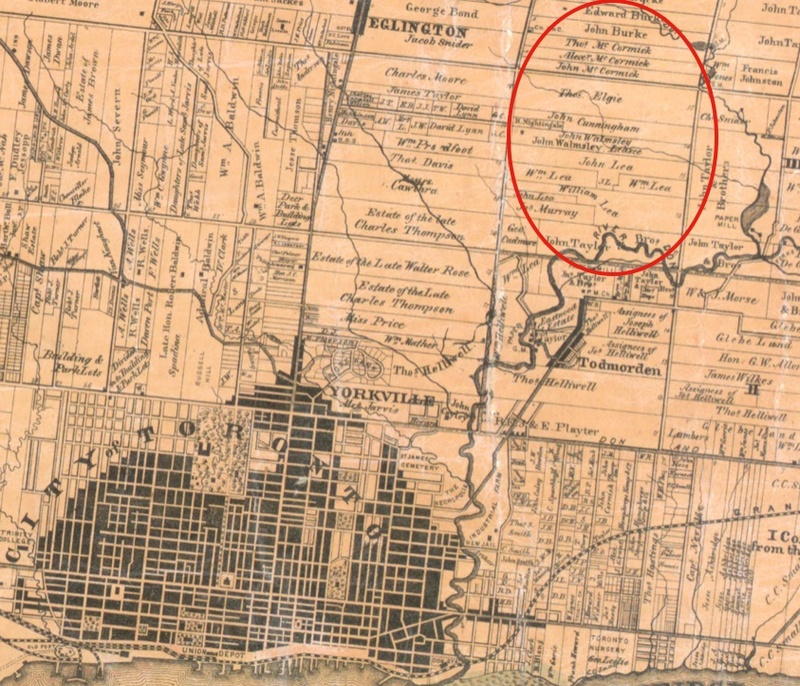 In 1912, Leaside had a population of just 43 people huddled close to the railway and hundreds of acres of farmland ear-marked for residential development. By 1929 there were still only 68 houses. Most lots lay vacant for a quarter of a century before 328 house were built in 1938. Three years later, in 1941, Leaside’s population had climbed to over 6,000 (See Image 5). 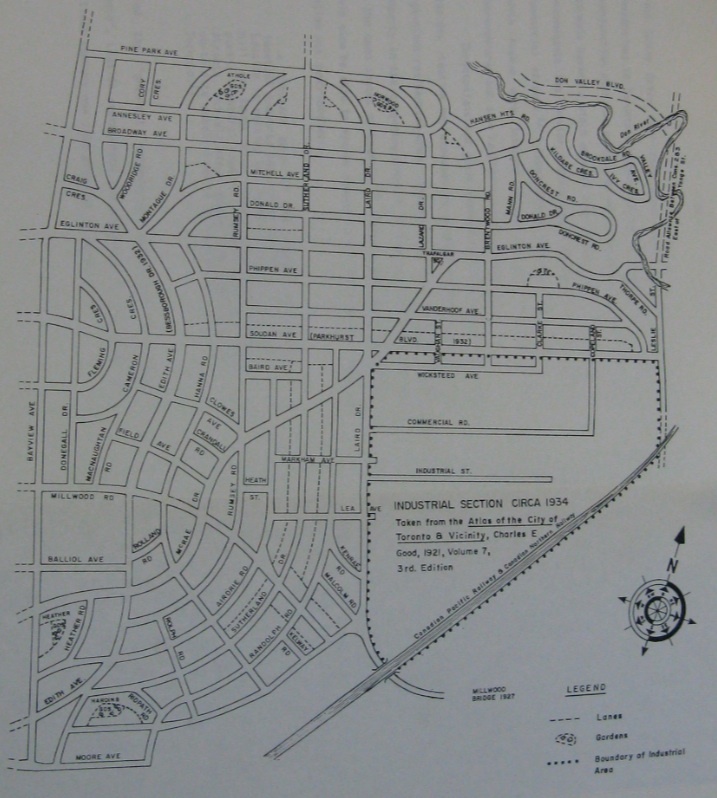 The development of the remainder of the original York Land Company’s residential lands was finally completed in the 1950s – around the same time as plans for Don Mills were being drafted. Image 5: Aerial view of Leaside, 1942. Top of image is south. 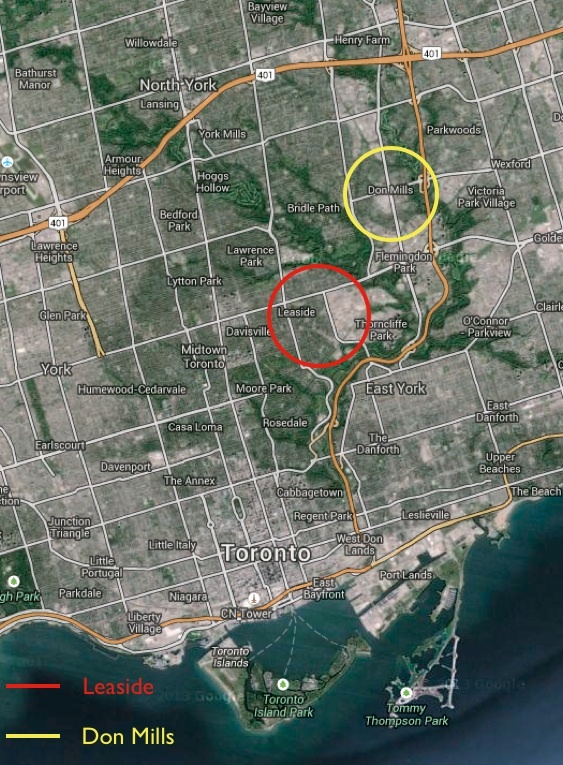 Note Don River winding through valley to the south. Source: City of Toronto Archives, Fonds 1231, Item 1981. The history of Leaside is a distinct chapter in the history of suburban development in Canada. It was part of a very select group of Garden City plans in the country. But unlike the plan for Port Mann and Mount Royal, Leaside did not fulfill its vision until the Second World War and after. Leaside predates Don Mills by forty years, making it Toronto’s oldest planned corporate suburb, and arguably the oldest of its size in Canada. The irony, however, is that while it existed on paper alone for nearly a quarter of a century, the vision that the CNoR and Frederick Todd had for Leaside was ultimately realized. Although Leaside took more than four decades to complete, it turned out much the same way as nearly all suburbs. In this sense, Leaside is both anomalous and representative of twentieth-century North American suburban development. Like the streets that characterize the neighbourhood and set it apart from the rest of Toronto, the history of Leaside is not straightforward – but it still ends in the suburbs. Clay, Charles. The Leaside Story, (Toronto: the Leaside Council, 1958). Harris, Richard. Creeping Conformity: How Canada Became Suburban: 1900-1960. (Toronto: University of Toronto, 2004). Pitfield, Jane. Leaside, 2nd Ed. (Toronto: Dundurn, 2000). Rempel, J.I. The Town of Leaside: A Brief History, (Toronto: East York Historical Society, 1982). Rennick, Kathleen. “The Town of Leaside: Origins and Development, 1913-1939,” (Department of Geography Research Project, University of Toronto, 1986). J.I. Rempel, The Town of Leaside: A Brief History, (Toronto: East York Historical Society, 1982), 14-15. Jane Pitfield, Leaside, 2nd Ed. (Toronto: Dundurn, 2000), 23. Nice post. I was surprised to read that this once-wealthy model suburb (birthplace of Stephen Harper) was a factory town for so long! It’s also interesting, although less surprising, to hear that Canada’s oldest planned suburb didn’t develop according to plan. Great article Andrew. Your post fills in some key Toronto suburban history for me — a topic dominated by discussion of Don Mills and post WWII. Great post, Andrew – thanks! By the way, I grew up on Brentcliffe Road … I just didn’t want people thinking that something about Leaside itself gave rise to right-wing Conservatives.